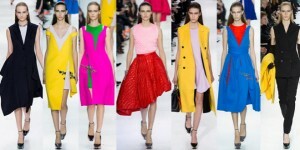 The known Belgian designer Rag Simons presented one the most spot-on collections for Christian Dior. A truly haute couture breath-taking catwalk, given in an incredible location amplified by big mirrors 20 meters high, serving as a outline to the fashion show; 50s, 60s, 70s inspired dresses were multiplied by the mirrors with great effect. The flair of the creator of these graceful, tenuous or strong fabric sculptures with melded colours expands without limits in playful wrinkles and stripes, austere embroideries and fabric, rhinestones and trains in a growing up of originality and refinement. All of the most renowened names of the star system were there as usual, together with all the other personalities of the fashion world. The new Simons collection by Dior articulates on delicate hues like pearl-gray, white and powder pink but also light blue, black, red; plain colour and colourful geometry alternate with dazzling white of pastel colours highlighting paillettes and strass styles; there are broad, stiff, swollen skirts as well as dresses sliding extending on the whole body. More space has been given to colourful varnish tight boots: turquoise, almond, white are the prevalent colours.